Timothy Shriver is a social leader, educator, activist, film producer, and business entrepreneur. He is the third child of Eunice Shriver, founder of the Special Olympics. As chairman of the Special Olympics, he serves more than three million athletes in 180 countries. He cofounded and currently chairs the Collaborative for Academic, Social, and Emotional Learning (CASEL), the leading research organization in the United States in the field of social and emotional learning. Shriver earned his undergraduate degree from Yale University, a master’s degree from Catholic University, and a doctorate in education from the University of Connecticut. He lives in Maryland with his wife and five children. 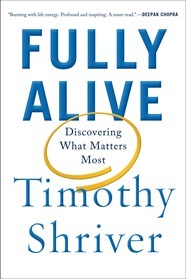 In Fully Alive, an unusual and gripping memoir, Timothy Shriver shows how his teachers have been the world's most forgotten minority: people with intellectual disabilities. "What a day!! Timothy is a great speaker, guest, and person!! I cannot compliment him enough! I can't tell you how many people stopped to talk to him to tell him about their connection to his family, the Special Olympics, even Cape Cod, and he listened patiently and charmingly...He is so cordial and genuine--a delight. "The speech was masterful. At one moment, he had the audience cheering; at another, he had them in absolute silence (something tough to do in our gymnasium where the speech was held) when he told the story about one Special Olympian whose feat was to move a bean bag inches. Many, myself included, were in tears! "He expertly wove his personal journey with the Special Olympics story. If anyone came to the event thinking that people with special needs could not teach us something, they learned otherwise. Shriver illustrated again and again that special needs persons have something to teach us, namely, to be our authentic selves." "Sincere, profound and deeply satisfying." "Bursting with life energy. Profound and inspiring. A must-read." "Timothy Shriver has written a lovely, honest, and inspiring book that draws on his own wisdom, life experiences, and pioneering work as a champion of the intellectually disabled to offer important lessons for all of us." "Timothy Shriver is not only a gifted writer but a profound intellect and a genuine seeker of the deep truths that make any human life worth living. To read this book is to have your own experience illuminated by an immensely compassionate being, to embrace your own limitations, and to move on with a warmer heart, a more peaceful mind, and a joyfully uplifted spirit." "This is a beautiful book about love, meaning, and the Kennedys. It is about Joseph and Rose’s life with Rosemary, their daughter with an intellectual disability, who was a tragedy, yes, but also an amazing and precious person, a blessing to her family, challenging and beloved, a radical teacher of the value of each human life. This is the story of Rosemary Kennedy’s role in leading the family to its force as advocates for the disabled all over the world, of her sister Eunice Shriver’s founding of Special Olympics, of her nephew Timothy’s dedication to this great cause. I was lifted, edified, riveted."